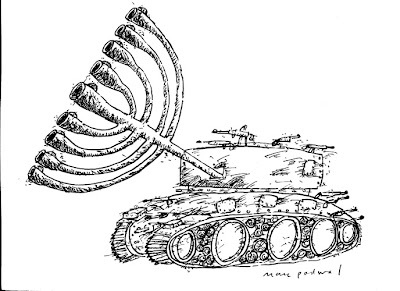 Forum Gallery’s Holiday exhibition, Peace on Earth (November 25 – December 30, 2011) explores the ways in which contemporary and Twentieth Century artists respond to the links between religion, war and man’s struggle for peace. casings, revolvers and gunshot. Farrow, a deeply committed humanist, has been working in social realist themes for decades, and has devoted himself to the examination of the historical connection between war and religion since 2001. The exhibition includes two new collages by David Mach, a Lesley Dill wall sculpture, and works by Robert Motherwell, Mark Podwal, Ben Shahn, Walter Martin & Paloma Munoz, Kathe Kollwitz, Raphael Soyer and more. Israeli Tank by Mark Podwal was published in the New York Times OP-ED in 1989, and it won an award from the Society of Newspaper Design. © Mark Podwal, courtesy of Forum Gallery, NY. I am going to see this! !